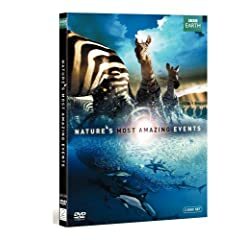 From the Arctic melt of spring to the great migrations of the Serengeti, BBC Video™ circles the globe to bring Nature’s Most Amazing Events to DVD and Blu-ray disc. This six-part series combines the epic cinematography of the sensational Planet Earth series with emotional and powerful storytelling to convey the most monumental natural events that occur on our planet. This two-disc set includes all six breathtaking episodes along with an entire hour of special features including a special “making of” video diary that provides a glimpse at the heroes behind the camera. Nature’s Most Amazing Events will be available on June 16,2009.
below. Last date for entries is June 19, 2009.